There have been numerous posts on a certain local blog documenting any time Nationals paraphernalia is worn on a TV show, or in the background in a live studio audience, or on a pet on a TV show or, well ... we stopped keeping track some time ago. 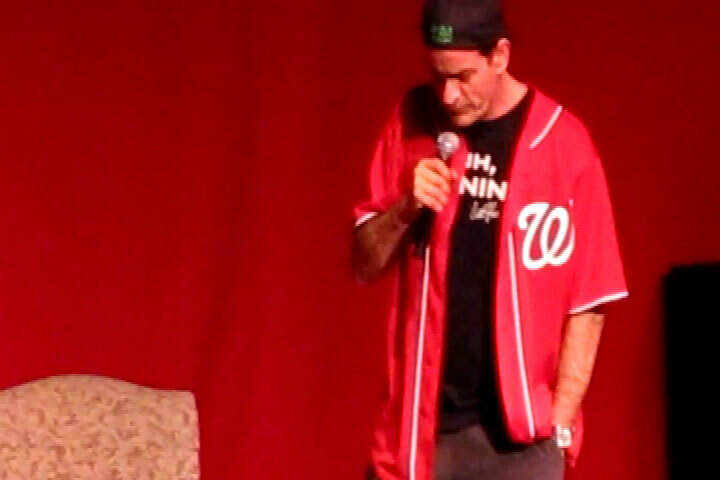 But when Charlie Sheen wears a Nationals jersey on stage, that's news. Oh well, we'll discuss it anyway. So Sheen emerged at DAR Constitution Hall Tuesday night for the D.C. leg of his "Torpedo of Truth: Defeat Is Not An Option" tour wearing a red Nats jersey with No. 99 "Vaughn" on the back. For those of you not familiar with Sheen's early work, before he was laying down with goddesses, he was mowing down batters as Ricky "Wild Thing" Vaughn in the movie "Major League." Back then, Vaughn was a member of the hapless Cleveland Indians. So some creative licensing was done to update the Wild Thing image for D.C. Unfortunately, the jersey didn't bring him as much luck in Washington as it did in Cleveland. Sheen was nearly 70 minutes late for his D.C. stop, and the show received lukewarm reviews. Maybe it's time to forget the standup, Charlie, and give 'em the theater?